Game Day is fast approaching; why not spend the time beforehand trying to win free catering for your party? From January 11th through January 23rd, you can enter our catering giveaway. 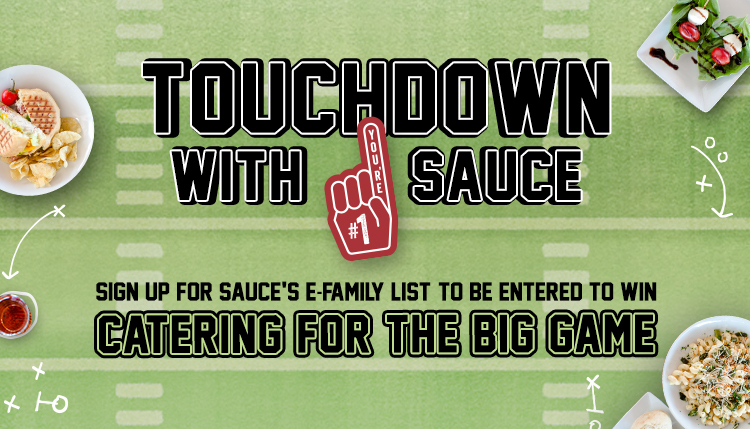 Four lucky winners will be chosen on February 1st to receive a free catering package* for their Big Game festivities! If you’re already a member of our E-Family, then you’re already entered – see, easy as PIE! If you’re not a member, then subscribe to be entered between 1/11/2017 through 1/23/2017! We promise not to flood your inbox. In case you didn’t get the memo, we’ve revamped our catering – we’ve spiced up old packages and added a few new ones. Each Party Pack serves 10 and prices vary, so choose wisely! For the official contest rules, click here. *Maximum value of $150. Cannot be combined with other offers or discounts. Valid at all Sauce locations. Giveaway ends January 23rd, 2017. Winners announced January 27th, 2017. Redemption of prize expires March 31st, 2017.